I've temporarily gone AWOL from my studio. Read below for the reason. My second job is working on the US Route 89 project. I'm very enthusiastic about it. My husband, Jim, got fascinated by this historic road, which goes from Mexico to Canada, about 8 years ago. Gradually, the fascination turned into a passion. When I began working on my art practice full time 2 years ago, two things became apparent to me. One was that this project of Jim's was such a major undertaking, there was no way he could do it all by himself. It made sense for me to begin to help out. Secondly, it would be great to experiment with doing a creative collaboration with Jim. As with any collaboration, we're constantly working out the wrinkles in the system. 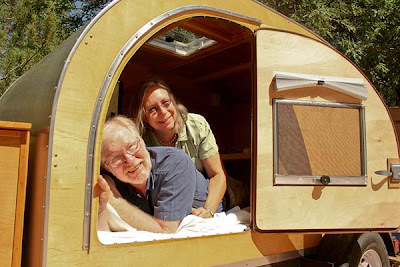 The picture, above, taken by our photographer friend, Jewel Clearwater, shows us in the "Pod", our teardrop trailer, anticipating our upcoming trip. Now for the changing gears part. And the crabby about it part. I love doing this work with Jim. But no matter how hard I try, it seems that the first few days of travel (okay, I admit it, sometimes a few more than a few), are a difficult transition for me. I'm not in my studio working. I worry that maybe somehow, I'll never manage to get into my studio to work again, once my routine is disrupted. I have trouble looking at the big picture. My gears are grating against each other. Here I am, in the Pod, at a lovely campground, with a cup of coffee. I'm grumpy nonetheless. It's early in the morning (6 am) and instead of lounging about relaxing, we need to move along and get back on the road. Stay tuned for progress reports when I have internet access and time. We'll arrive back home on August 13. By the way, here's the website for the Route 89 project. It's fabulous! 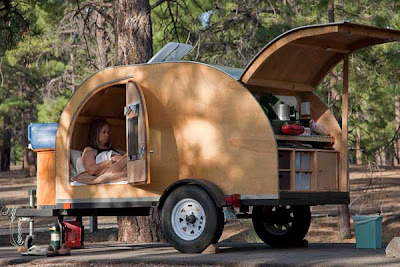 Not only have you gotten me interested in Highway 89, but I gotta say I LOVE the pod teardrop trailer! Did you make yours or...? Anyhow, I get the grumpy-about-not-making-art part too. Thanks for your honesty and humor. Sending you lots of enthusiastic support for creative times on and off the road. Thanks, Liz. I'm finally back to catching up on blogging etc., after the trip and then a scramble to finish work for my show. The tear drop trailer is made by a guy in Logan, Utah. You can find him at http.//www.teardrop72.com. It's great to haul, you hardly notice it, and comfy to sleep in. Members of US Route 89 Appreciation Society get a 5% discount. Love your work. I follow your blog, too!